There are so many amazing rubber stamping techniques out there, and new ones are being thought up all the time! Since it is good to be a life long learning, I’m going to be teaching a variety of technique class. The first class will be on May 1st at Heather’s house. It is a heat embossing class, and we’ll be learning three different heat embossing techniques. The first card we’ll be making will be embossed in black and water colored. I posted it last week. The second card we’ll be making uses the emboss resist technique. 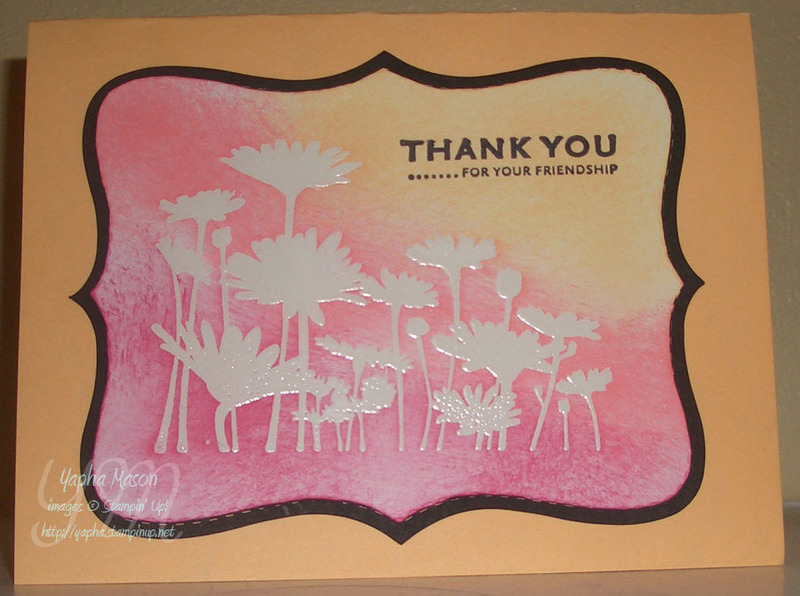 To do this, you first stamp your image in VersaMark on Whisper White or Glossy Card Stock, and emboss it with clear or white embossing powder. Ink is then sponged over the top, but it doesn’t stick to the embossed areas, causing the design to show through. It is a stunning technique, and easy to do once you know how. Here is the card we will be making. I got the idea from Gretchen Barron’s blog. Come join us if you are in the area! Remember, if you don’t want to make your own cards, you can always buy some beautiful handmade cards in my Etsy shop.